Born in Leicester, England, into a working-class family, Allen was the elder of two brothers. His mother could neither read nor write. His father, William, was a factory knitter. In 1879 following a downturn in the textile trade of central England, Allen's father travelled alone to America to find work and establish a new home for the family. Within two days of arriving his father was pronounced dead at New York City Hospital, believed to be a case of robbery and murder. At age fifteen, with the family now facing economic disaster, Allen was forced to leave school and find work. In 1903 Allen published his third and most famous book As a Man Thinketh. Loosely based on the Biblical passage of Proverbs 23:7, "As a man thinketh in his heart, so is he," the small work eventually became read around the world and brought Allen posthumous fame as one of the pioneering figures of modern inspirational thought. The book's minor audience allowed Allen to quit his secretarial work and pursue his writing and editing career. In 1903, the Allen family retired to the town of Ilfracombe where Allen would spend the rest of his life. 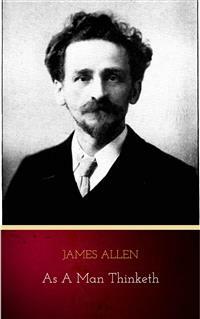 Continuing to publish the Epoch, Allen produced more than one book per year until his death in 1912. There he wrote for nine years, producing 19 works. "He never wrote theories, or for the sake of writing; but he wrote when he had a message, and it became a message only when he had lived it out in his own life, and knew that it was good. Thus he wrote facts, which he had proven by practice." Mind is the Master power that moulds and makes, And Man is Mind, and evermore he takes The tool of Thought, and, shaping what he wills, Brings forth a thousand joys, a thousand ills:— He thinks in secret, and it comes to pass: Environment is but his looking-glass. by virtue of the thoughts, which they choose and encourage; that mind is the master- weaver, both of the inner garment of character and the outer garment of circumstance, and that, as they may have hitherto woven in ignorance and pain they may now weave in enlightenment and happiness.